BMSI Financials give you all the tools you need to take control of your government and school finances. An incredibly affordable system that meets all accounting standards. Easy to use, superior support. BMSI is the logical choice. The WebLedger™ General Ledger module is the foundation for all accounting operations and provides access to the financial data required by management for decision-making. You can setup an unlimited number of general ledger accounts. The use of account with classes or subaccounts provides you with up to 30 characters for transaction coding and financial reporting. In addition to allowing Journal entries and year end closing activity, all transactions from other modules are posted to the Gen. Ledger. The Gen. Ledger supports actual, budget, closing, and encumbrance transactions allowing full control of the type of information stored and presented on financial statements. Our intuitive yet powerful fund accounting and budget preparation module takes the complexity out of entering, maintaining, tracking and reporting detailed financial data. Online Batch System, Fund Accounting ,Check Reconciliation ,Budget Preparation ,Purchase Order control ,Treasurer’s Cash Receipts, Reports ,System Compliance adheres to government accounting standards. Multiple Funds,Due To/Due From Account Mapping,Budget Control,Encumbrance Accounting,Line Item Allocations,Complex Allocations,Document Management,Account Number Length,Account & Class Segmentation,Reports,Online Query,Report Writer. The WebLedger™ Budgeting module provides the flexibility needed to maintain and track budgets necessary for analyzing your organization’s financial performance. You can produce “what if” scenarios by entering and tracking revisions to an unlimited number of budgets at an account, class and/or Grant/job level.You can view online comparisons of actual period-to-date and year-to-date activity to budget amounts. Budgets can be easily copied or exported to Excel format for modification and then imported.Online budget transaction inquiry screens provide immediate access to all current and historical budget information. Budget queries and financial reports with drilldown capability provide in-depth budget details for examining your organization’s budgeted financial plan. 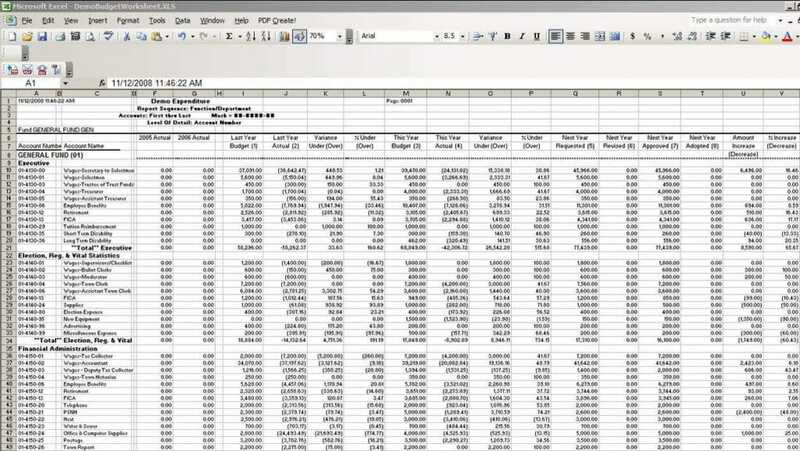 The WebLedger™ Allocations module performs the functions necessary to streamline your period-end closing process by automatically allocating or redistributing organization expense balances to one or more accounts.Unlimited allocation groups can be setup and maintained in the system. 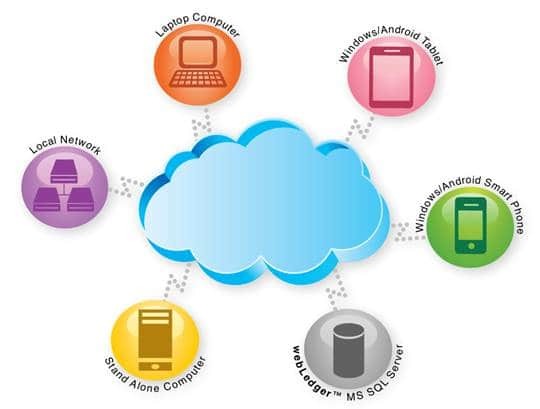 Any account or group of accounts can be allocated to one or more accounts using various allocations methods. User-defined unit, percent of total and rate tables allows you to define the calculation methods to be used in the allocation and have control over the accounts used in the transactions. An offset account and class can be specified for each allocation group, as well as a sequential processing order.The allocation process allows you to supply a post date, selectively process allocation groups and once processed, review the results prior to posting the transactions to the general ledger. 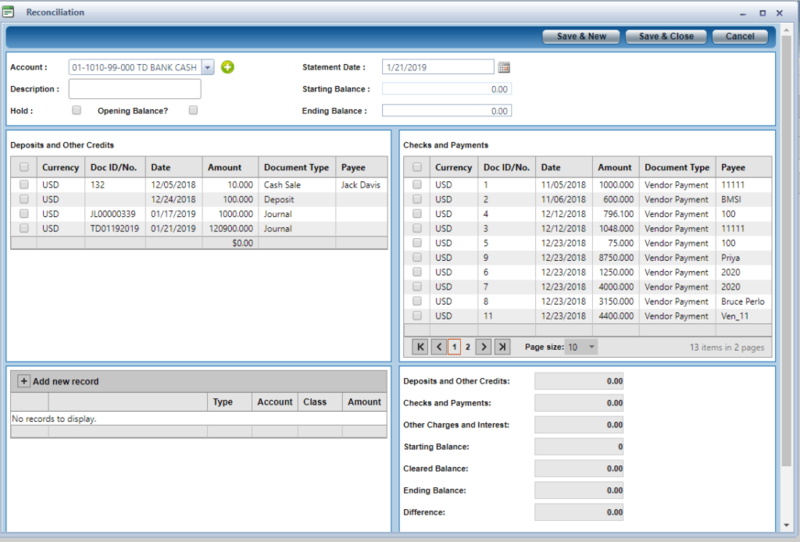 The WebLedger™ Cash Manager module helps you efficiently handle your banking transactions, such as: the deposit of cash receipts, check writing and bank statement reconciliation including interest, service charges and other transactions.Deposits can be automatically generated from cash receipts entered in the WebLedgertm Accounts Receivable module and printed on bank deposit slips. Checks may be entered and printed on pre-printed and/or blank check formats. Checks may be voided individually or in group selections.The Reconciliation application allows you to easily clear deposit and check transactions as well as enter interest and bank fees in one central location. If the payroll is used, the payroll checks can be reconciled here as well Online deposit, check and reconciliation inquiry screens provide immediate access to all open and historical Cash Manager documents. Cash Manager queries and reports with drilldown capability provide in-depth cash manager transaction details necessary for effective cash management. 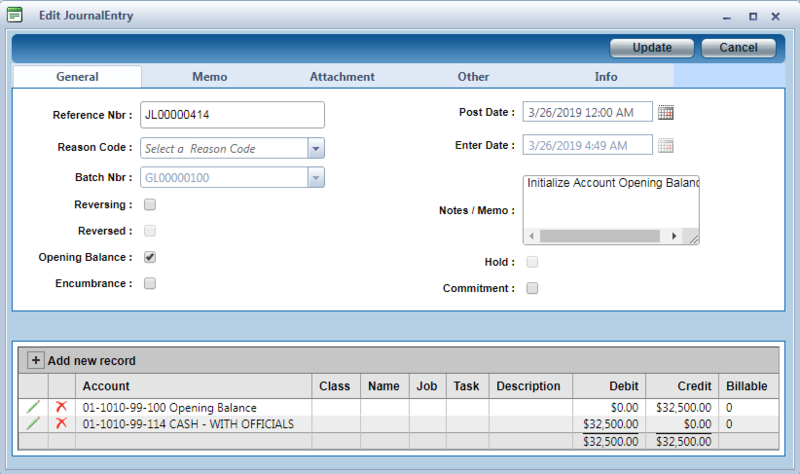 The WebLedger™ Accounts Payable module helps you effectively manage vendor accounts and control costs. A comprehensive vendor account setup allows you to assign default expense account, tax and 1099 information. An unlimited number of vendor accounts can be setup with unlimited purchase from and remit to addresses, contacts and memos for recording supplier account information. Data entry time is reduced by generating vendor bills from inventory item receipts, purchase orders or recurring voucher templates. Distribution templates allow you to easily allocate expenses among departments or locations. The WebLedger™ Purchasing module performs the functions needed to enter and process product and service purchase orders. 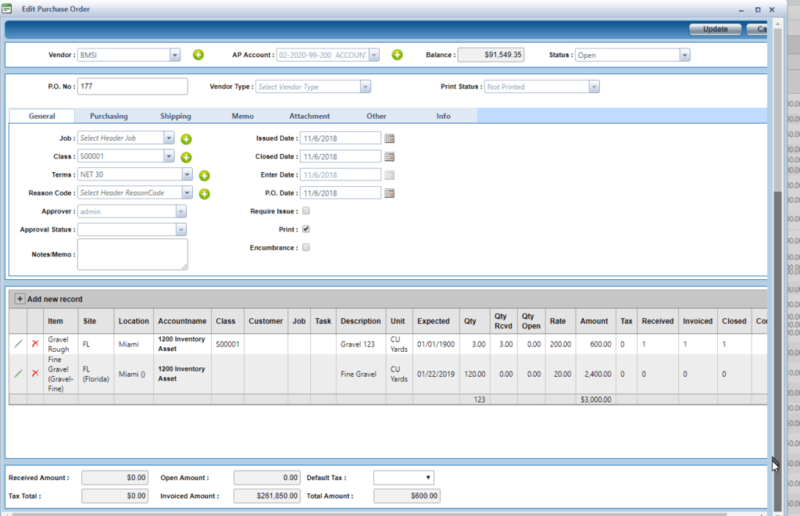 Optionally a purchase order will encumber the funds for each line item. You may establish a purchasing approval hierarchy and assign purchasing approvers and minimum purchasing amounts to users. An approval queue allows all purchasing approvers to easily review all pending purchase orders at once and reject or approve as necessary. The WebLedger™ Requisitions module performs the functions needed to enter and process material purchase requests for your organization. You may establish a requisition approval hierarchy and assign requisition approvers to users. An approval queue allows requisition approvers to easily review all outstanding requisitions at once and reject or approve as necessary. The WebLedger&trade; Grant/Job Costing module provides a flexible job setup process that allows you to track the jobs or projects that you perform for your customers or internally within your organization.An unlimited number of Grants/jobs can be setup and maintained in the system. An unlimited number of user- defined types and statuses can be defined in the system. Default values can be assigned to reduce data entry time. Optionally, Grant/job activities can be divided into tasks.Grant/Job information can be coded to each document and transaction entered in every WebLedger™ application module. Job profitability can be easily analyzed with income statement and other revenue and expense job reports. Drilldown capability in these reports enables you to quickly access original documents and transactions. The WebLedger™ Time Entry module allows your employees or outside vendors and contractors to enter their work hours by activity and date. Grant/Job information can be assigned to each activity, as well as varying rates for the individual entering time. Informational notes may also be assigned to each activity.Time entries can be marked as billable and available for r invoicing in the Accounts Receivable module.Online time entry inquiry screens provide immediate access to all open and historical time entry documents. Time entry queries and reports with drilldown capability provide in-depth time entry transaction details necessary for effective time entry management.Time Entry can be interfaced to payroll. 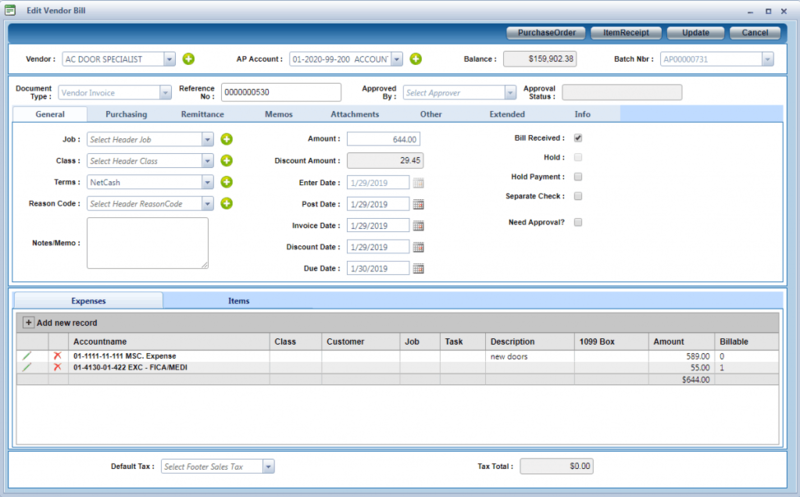 The WebLedger™ Invoicing and Accounts Receivable module helps you efficiently manage your citizen’s accounts and provides a streamlined process to meet your miscellaneous invoicing and collection requirements.The Accounts Receivable can optionally be linked to WebLedger™ Tax and Utility Billing modules. An unlimited number of accounts can be setup with unlimited billing and shipping addresses, contacts and memos for recording vital customer information. Customer accounts may be grouped into parent and child relationships for collection purposes. Invoices can be automatically generated from recurring templates or billable time and expense entries entered in other modules. The WebLedger™ Inventory module performs the functions needed to efficiently manage an inventory. An unlimited number of stocked, non-stock or service items can be setup and maintained in the system. Items may be tracked by serial number and assigned to categories with unique attributes. An unlimited number of tiered pricing breaks and discounts can be defined by item. FIFO, average cost or standard cost valuation methods are supported for stocked items.Item receipts, cost and quantity adjustments, issues to jobs and physical count processing is performed in the Inventory module. 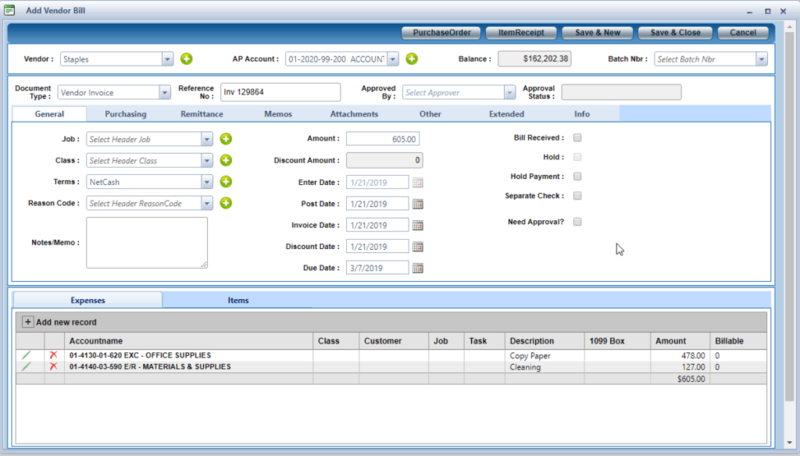 Item receipts can be automatically generated from purchase orders entered in the Purchasing Module and used to generate vendor bills in the Accounts Payable module. Inventory costs and quantities are updated by documents entered in the Invoicing, Accounts Receivable, Purchasing and Accounts Payable modules when stocked items are ordered, received, shipped and billed. Item quantity available calculation logic is configurable in Inventory Setup. Online item receipt, item adjustment, item sale and physical count inquiry screens provide immediate access to all open and historical inventory related documents. Inventory queries and reports with drilldown capability provide in-depth inventory related transaction details necessary for effective inventory management. The WebLedger™ Multi-Site Inventory module expands the functionality of the Inventory module by allowing you to track item quantities and costs by site, and use multiple locations in the site for an individual item. You can also track item use and purchases by site and location. During work order entry, you can easily determine item quantities on hand in each site and location combination. When purchasing items, you can specify the site and location where the items should be received. Default site and location values can be setup for each item to reduce data entry time. Item transfers between sites and locations can be simply recorded in a central item adjustment application. Online item site and location inquiry screens provide immediate access to all up-to-date item cost and quantity information. Multi-site inventory reports with drilldown capability provide in-depth inventory transaction details for managing your inventory stock and costs across multiple sites and locations. The WebLedger™ Fixed Assets module performs the functions needed to maintain and track your organization’s assets. You can setup an unlimited number of assets and track purchase, sale and depreciation information. Assets can be categorized by assigning user-defined asset types with default life years by type. The system supports straight-line, declining balance, and double declining balance depreciation methods and automatically calculates depreciation amounts for assets assigned to these methods. You may also elect to manually enter depreciation amounts or make manual adjustments to asset depreciation. Online asset and asset transaction inquiry screens provide immediate access to all current and historical asset information. Asset queries and reports with drilldown capability provide in-depth asset transaction details necessary for asset tracking and management. Account-Class Validation:The WebLedger™ Account-Class Validation feature allows you to define combinations of accounts and classes to be validated at data entry time. Account & Class Segmentation:The WebLedger™ Account & Class Segmentation feature allows users to define up to 10 segments for each of the 30 character account and class fields. Segmented codes can increase the efficiency of referencing and reporting information by allowing each segment code to fulfill a specific record identification purpose, such as sales division, department or location. You can also establish valid values for each segment. Account Categories:The WebLedger™ Account Categories feature provides the ability to establish groups of accounts with like account types in order to report transaction activity together. Batch Control:The WebLedger™ Batch Control feature allows you to enter documents such as invoices, vendor bills and checks in batches to be reviewed and approved before posting to the customer or vendor or general ledger account balances. A batch release process allows you to release all types of batches for posting in one centralized application.Batch reporting with drilldown capability allows you to review and edit the documents prior to release, as well as verify batch general ledger account distribution transactions. Dashboard:The WebLedger™ DashBoard provides a snapshot of key information that can help you monitor the financial position of your Organization. Pricing:The WebLedger™ item pricing features supports complex pricing structures by providing the ability to setup cost plus markup or discount pricing, pricing by quantity breaks, specific price or percentage discount overrides, overrides for a specific date range and overrides at a document level. Memos:The WebLedger™ Memo feature allows you to enter an unlimited number of memos to each entity or document to record vital customer service, shipping or general information. Attachments:The WebLedger™ Attachment feature supports a paperless accounting system by allowing you to attach an unlimited number of files, such as spreadsheets or scanned documents (invoices, receipts, bills) to each accounting document. Role Based Security:WebLedger™ Role Based Security allows you setup roles or categories of functions performed by users of the system and assign rights to specific applications and reports based on the associated job tasks for the role. You may grant read-only, add, modify, post or delete rights to each application.Each user can be assigned a role. When users login to the system, the menus will be limited to the applications for which they have access. Advanced Security:The WebLedger™ Advanced Security feature provides additional levels of security beyond the application and task- level security provided by WebLedger™ Role-Based Security. Advanced Security allows you to establish data groups that identify specific account, class and job values in the system and then assign users to these data groups to restrict their access to data necessary for their specific department or division. Users can be assigned two different security data groups, one for data entry and one for reporting or viewing. 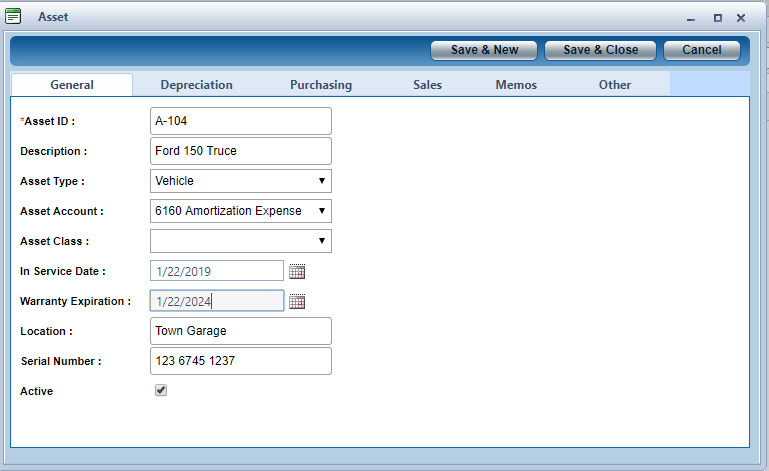 Customizable Reports:Many WebLedger™ reports are customizable including financial and transaction reports. Drilldown:Many WebLedger™ reports allow you to drilldown directly into the transaction details in the original data entry screens where they were entered. Report Writer:The WebLedger™ Report Writer is a full-featured WYSIWYG report layout tool for creating and modifying reports. Report Consolidation:The WebLedger™ Report Consolidation feature provides the ability to include data from one or more Organizations for a given report at runtime. An unlimited number of affiliate organizations can be setup for each WebLedger™ installation and included in any report.